Dandelion (Taraxacum officinale) is a very common garden weed; and also considered by many to be a “super food” for both birds and humans. Before you go digging up those dandelion looking weeds from your garden and disposing of them, or worse; spraying them with herbicides, consider them a welcome free food that your parrots will love. Beyond just enrichment, they can also have significant health benefits. Even birds who do not usually take to greens with much enthusiasm will often take interest in dandelions, even if it’s just to play with or tear into pieces to start with. You can also grow these plants in an aviary if you have a natural floor. Collecting the seedheads of the dandelion once it reaches the familiar white fluffy seed head stage after flowering allows you to have a continual source of this plant. Being a weed means that Dandelion grows well in almost any conditions. This site has a good step by step guide to growing dandelions from seed. Dandelion is well known for its benefits to the health of the liver and its ability to remove toxins from the body. With liver disease and liver related ailments being so common in captive parrots, dandelion should be at or near the top of the list for healthy foods that can help combat and prevent a parrot from developing potentially fatal liver related health problems which can come about as a result of a poor diet and weight gain due to limited physical activity (lack of flying). 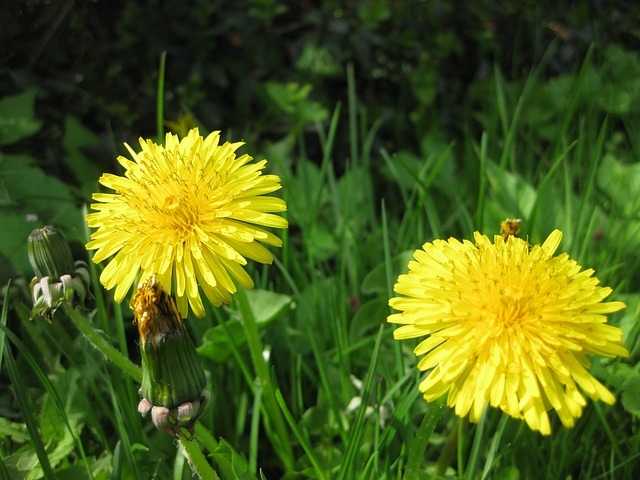 This is of course not an alternative to seeking veterinary advice and treatment – but including Dandelion as part of the diet can only add to overall liver health in any bird. Along with Dandelion itself, there are several Dandelion lookalike plants that can spontaneously pop up in gardens as so called weeds. Some of these are also edible and beneficial, which means you don’t always have to stress about whether you have picked a Dandelion or what can be known as a “false dandelion”, amongst other names. A very similar looking plant to Dandelion and one that is easy to confuse, is Cat’s Ear or catsears. Other names for this weed that are often used are Flatweed or not surprisingly, False Dandelion. That’s because the plant when not in flower looks very much like a Dandelion and you’ll have to look closely to distinguish the two. The good news is that Flatweed is also edible so it doesn’t matter if you’ve misidentified it as a dandelion. Dandelion leaves are more sharply angled, but false dandelion have more rounded leaves. The multiple flower stems of Flatweed are not hollow. The single flower stem of a Dandelion is hollow.